A long anticipated title in the fighting game community. Skullgirls is a first time outing from developer Reverge Labs which consists of the creative talents of competitive fighting game veteran Mike Zaimont. Skullgirls is set in the fictional setting of the Canopy Kingdom, a cartoonish art deco depiction of early 20th century America. Each fighter in the Canopy Kingdom is competing for the opportunity to obtain the mysterious Skull Heart, an artefact that is rumoured to grant a woman any wish they desire but at a heavy price. The current owner of the Skull Heart is the legendary monster known as The Skullgirl who lost her humanity as the result of using the artefact for impure and selfish reasons. Each character follows their own path. Any great fighting game requires a cast of strong and memorable personalities in order to succeed and Skullgirls is no exception. Each character in this all female cast is uniquely styled with their own persona and this shows in every single facet of their design from hair and clothing, voice direction and even their very moves and techniques. Being the first game in the series, the plot of Skullgirls manages to benefit from the lack of inconsistency that plagues the majority of fighting games on the market. One could argue that this was also achieved through its humble cast size but it is clearly evident that the world and back story was the result of careful foreshadowing. The game offers a story mode which provides a greater insight into the characters backgrounds and while there is a commendable usage of coherent story and characterisation it is no more or less engaging in the plot department than any other fighting game available. The real shame is that despite clear evidence of a much more fleshed out world, the majority of this information almost seems to be missing from the final product which we can only hope will be further explored at a later date. Skullgirls will feel somewhat familiar to most people who dabble in fighting games. Influences in the control scheme and gameplay system burrow aspects from Street Fighter, Marvel vs Capcom, Guilty Gear, Blazblue and even Capcom vs SNK but ultimately despite the odd similarities dotted here and there, Skullgirls is very much its own unique beast and a finely crafted one at that. The fighting mechanics are a dream allowing players to construct a team of up to three characters which provide greater match-up variety, extended combos, assist attacks and health regain in contrast to relying on one solo powerhouse of a character that can practical kill with one prolonged combo. What is simply the most amazing/ridiculous looking fighting game character ever! 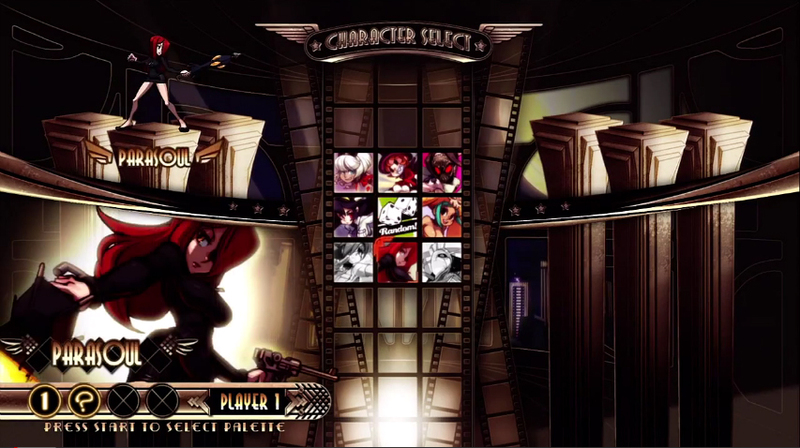 Skullgirls also attempts to add some further insight into its mechanics by offering a tutorial mode. Attempting to help new players, tutorial sessions start from the ground up covering simple movement, single button attacks and the basic game system. Later lessons delve into the art of good mix ups and provide some insight on how to defend against them as well. The final lessons delve into the full combo potential that every character has by adding juggles and air dashing into the mix. While it is certainly a commendable effort as few fighting games have offered this form of guidance in the past, the tutorial is still very thin and even fails to cover many aspects of its own fighting system including the highly praised infinite prevention system. Also the “how to play” section of this arcade title fails to mention any of these aspects either which will ultimately leave players unaware of the possibilities of the system’s full potential. The other stark contrast to this seemingly beginner friendly approach is that Skullgirls itself is far from being a casual fighting experience. Advanced application of expert techniques such as ambiguous cross-ups, footsies and dash cancelling are required for mid to high level play. But while the level of entry is just as high as its contemporaries, Skullgirls will award players with some memorable fighting moments and the almost certain probability of future community play. However one rather surprising omission which once again will hold back new players is the absence of an in-game command list. Though there is promise that they will be added at a later date in a patch it is inexcusable to be missing a necessary feature that has been seen in nearly every fighting game for the last ten years. Skullgirls main selling point like all other fighting games is in the competition that stems from its local multiplayer component. Luckily unlike many other fighting games currently available, Skullgirls is just as enjoyable to play online thanks to the inclusion of the now legendary 2D netcode GGPO. For any fighting game fan that has been frustrated in the past by online lag making the prospect of internet play un-enjoyable, the quality provided by GGPO will simply astound by comparison providing an almost seemingly lag free experience. Overall Skullgirls can feel very little light in content, which is a somewhat of a fair trade off for the budget price. The single player experience consists of the previously mentioned story mode alongside the inclusion of a standard arcade and training mode. Arcade mode simply provides an outlet to fight without the restrictions of using one character and having to watch cut scenes, just like its former the game ends with an infuriating one sided boss fight which will purely either be something that you love or something you hate. The tutorial mode like many aspects of Skullgirls is missing some important elements such as lack of full dummy setup parameters and move recording that are currently seen in every other title in the genre. Skullgirls is a truly stunning game in the visual department. Every aspect of the graphical design is the result of intricately detailed hand drawn animation and it shows. 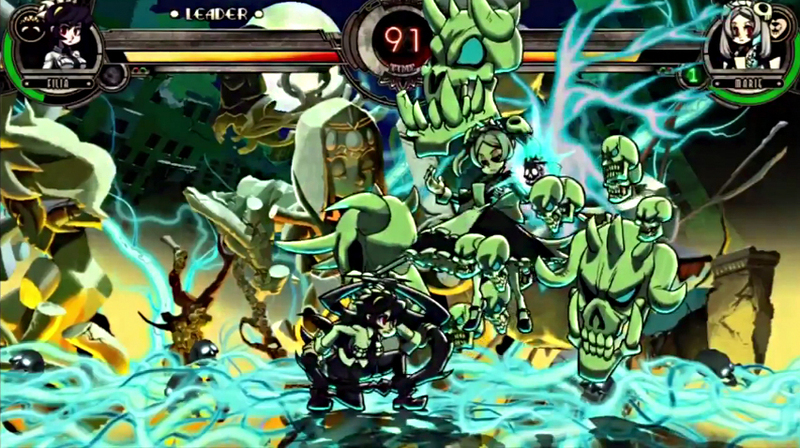 Skullgirls is an eye candy delight complimented by an explosion of colour that makes the game a true visual treat. The game’s universe also serves as a monument to many aspects of American pop culture. Influences range from the Merry Melodies Cartoons to the burlesque scene of the early twentieth century, prohibition era mafia stereotypes and even the works of H.P Lovecraft. 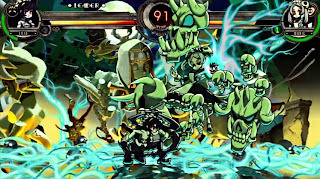 Skullgirls is a true slice of classic Americana though many eastern pop culture references subtly creep into the presentation as well, which will delight fans when they discover subtle nods to anime, the Street Fighter series, Pokemon and even the memorable sound bite of “One million troops” from Ninety-Nine Nights II producer Tak Fujii. The only issue that prevents the graphical aspect of the game from being perfect is seen in an odd glitch were for split seconds the character will disappear and their hitbox will appear in their place, then just before you have a chance to realise what happened things go back to normal. While far from being a disastrous issue it is noticeable none the less and is not convenient when in the middle of an extensive combo. The game is also complimented by a full soundtrack fronted by famous video game composer Michiru Yamane whose works include the original Rocket Knight Adventures and the entire ‘Metroidvania’ catalogue in the Castlevania series. While the music is well executed and coincides superbly with the actual setting it sadly lacks the necessary oomph seen in a fighting game soundtrack that is required to keep the action going. Just like the saying goes “You get what you pay for” and Skullgirls is a perfect example of that message. Don’t let the awkward missed trimmings and small roster put you off. Despite being thin in content Skullgirls is a well executed labour of love that earns its place to stand side by side with the cream of the fighting game crop.